I meant to share this at the time of the broadcast a month of six weeks ago. Life and an OU TMA got in the way. These are notes, things I picked out, some reflection on my take on all of this. Perhaps we are like minds? Perhaps not? I’m trying to make sense of it … I’m not saying I’ve made sense of it here or in a hundred or more posting on a similar theme that I have made online over the last decade reading the likes of Stephen Pressfield, Norman Mailer and Ben Okri, even David Ogilvy) who amongst many creatives have chosen to share their wisdom with the wider world. To be successful and creative is a rare thing, it isn’t simply a result of luck or talent or endeavour … a mind might be able to self-regulate and focus once it has found its medium and voice, but just as helpful are those around you who create parameters, who set deadlines, who chase you with a stick or reward you with a carrot. In this BBC Radio 4 broadcast Grayson Perry explored the myths and misconceptions of creativity. Like all things, hard work and single-mindedness. From my point of view I see myself as a Catherine Wheel that has been lit and fallen of its stand – I spit and twist, sending out ideas all over the place. Not the best way forward. We are reminded the ‘creativity’ is a central part of the UK economy. For 17 years I actively contributed to this. My wilderness years, the last eight, have resulted in very little output (if that means getting it out of the front door). I stack it. I’d prefer to see these ideas compost and die than give my ideas to the world. It is essential that creativity has institutional underpinning. How will this manifest itself with the cuts to arts funding now being proposed by the coalition government in the UK. or is it necessary. Whilst education in the UK has its faults it nonetheless appears to favour and permit the individual so that talent can develop. This must be the state system, private schools are a sausage machine for exam results, they have to be given what parents are forking out. Says Grayson Perry, he has this carved into concrete across the mezzanine floor of his studio. You try, you fail, you try again. I would like to suppose I haven’t tried hard enough to fix my failures (or what I perceive as failures). At time though I feel if I keep on trying I would eventually strip back a 90,000 novel to a few words. I’m a looker, so I don’t know how I’ve ended up writing. You can never be fully relaxed on holiday. I do, but sailing and skiing do occupy your head if you fall off cliffs and like to race dinghies. Moments of near-death are exhilarating, as those times the elements sweep you along. I hate the computer as a writing tool, this facility to edit does me no favours. yet a writer Grayson interviews said the computer allowed him to write, that until then he had no way to start straight in with a few thoughts, some scenes (like episodes in a film), and assemble it all in a non-linear way. I’ve worked so hard with programmes like Power Structure and Final Draft but somehow always tie myself in knots trying to add or remove a character or scene or changing the ending or beginning. ‘Letting go at the end – that’s as good as it will get.’ Says Rose Tremain. I would run with a lover, with the intensity of an unfulfilled affair. Something to make the heart race. I once spent a day drawing a girl I lusted for … she was happy to be naked for me. I compelled myself into a state of denial without able to control my arousal. It all went into the drawing, the excited, confident marks across the page. What about the University of East Anglia Creative Writing Course? I’ve locked at the details and would be applying for 2011. Don’t have the money. Anyone want to sponsor me? In return for a percentage of the royalties that would of course come about a year or two later? Or the MA in Fine Art at Sussex University? My wife caught this line and said that was me. She should know, she’s not had much out of me these last eight years. The novels I promised to write were written, but are considerably short of an edit I would send out. I would need to shut myself away from everything for 12 weeks. Do you have somewhere I could hide? Exam conditions six to nine hours a day, seven days a week. Not any man made disturbance – nature I can tolerate, nature I love. A hermitage on Farnes island would do, a ski lodge up a mountain pre-Season. somewhere. An empty barn, drained swimming pool, decommissioned nuclear power station. A chess set made out of branded bottles of water. Every ski run in the Ski Resorts of Val d’Isere and Tignes reconstructed as transects showing their true length and fall. Story ideas galore for TV series or film. A 6ft canvass of Lewes Castle in the snow from a series of photographs that could have been taken 800 years ago. This was in response to someone with an MRI scan who claims to have identified creativity. It doesn’t work like that, indeed, the creative mind goes more slowly … it takes it times over these connections. It thinks, how else could it ever deliver anything original? So when yo relax, you let go, that is when you have your great ideas. I resolved the ending to a story I haven’t touched for three years on a dog walk so long I found worried messages on the mobile phone I had left in the car. My mobile is rarely on. ‘The distressful bread of the day to day.’ Said Rose Tremain. Grayson Perry talked about his Inner Shed. I have my inner shed, what I need is a ‘room of my own.’ It’s hard to be creative perched on the end of the marital bed in a tiny room that is stacked to the ceiling with possessions that call for occupancy of a house twice the size. Should institutions such as the OU ditch their own platforms and assemble the best off the shelf offerings in one place? What this environment lacks is personalisation, as well as stats, friends, freedom to add apps and plug-ins and all the rest of it. This is a De Dion Bouton in the age of the E-type Jag. 1. Are we hard-wired to how we conceptualise ideas? 2. Does this help or hinder the way we use eLearning tools? 3. Will children, say, 50 years from now, look at paper and pen in the same way as a person does now when they take a first look at computer? 4. Are we at some ‘transition’ point, and if we are, what does this mean? My tutor in H808 asked me this on 12th September. I feel far better able to reply now after four months of H808 and some fortuitous reading, though I did respond at the time. My forum thread exchange then and reflection on it today will form part of my ECA. It surprises me that I have subscribed to a magazine at all, but I find the New Scientist offers plenty on our e-world upon which to reflect and insights to all kinds of other things that tickle my brain. It matters that you read broadly. The French Film Director Francois Truffaut was a firm believer of reading everything and anything that caught your attention. He’d have loved the web. It matters that you follow what the web offers, then browse the shelves for magazines at the newsagent on the forecourt of your station. We don’t think in chronological order. thinking is a mess, it selects ideas and makes things up sing different sides and corners and crooks and crannies of our brains. I unplugged the calendar on my diary in year one and replaced it with 12 themes that have now grown to 37. For a period there were 37 blogs, but try managing that, to say you end up with a split personality is an understatement. Dr Vilayanur S Ramachandran thinks so. We have a unique capacity to think in metaphors. This matters. It is this ability that makes us creative, allows us to be inventive, it is what makes us human beings. Read all about in the New Scientist. Quoted here within the 200 word count permission for a student quote. Added as for student reading in a non-commercial academic context having read the copyright permissions. Ramachandran is particularly interested in metaphor because it ties in neatly with his previous work on synaesthesia – a kind of sensory hijack, where, for example, people see numbers as colours or taste words. “Metaphor is our ability to link seemingly unrelated ideas, just like synaesthesia links the senses,” he says. After spending years working with people who have synaesthesia, he believes “pruning genes” are responsible. In the fetal brain, all parts of the brain are interconnected, but as we age, the connections are pruned. If the pruning genes get it wrong, the connections are off. “If you think of ideas as being enshrined in neural populations in the brain, if you get greater cross-connectivity you’re going to create a propensity towards metaphorical thinking,” he says. Of the 12 photographs in this issue as many as 8, I think, are from the Getty Image bank. I wonder if one day, especially if I’m reading this on an iPad the images will move, rather as the paints are alive in the background of a Harry Potter movie. It wouldn’t take much for a photography to video as well as, or instead of taking a photograph. Indeed, the BBC now permit directors to generate HD TV footage using digital SLR cameras … the lenses are better, the creative choices wider. How we use the web, let alone e-learning tools is in its infancy. We are still putting old ways online, still making web-pages into slide shows and calling them immersive learning. Gaming may change this, with the budget. Better, faster tools will enabled more. 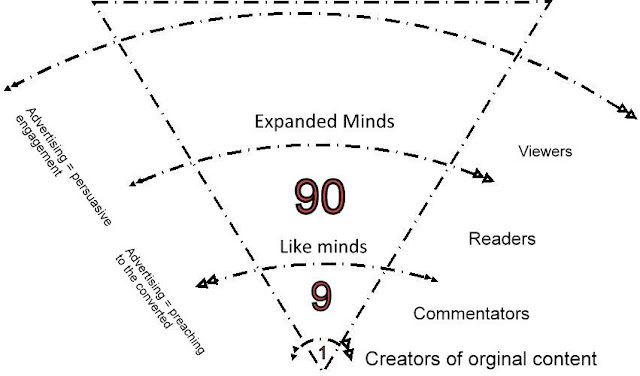 Collaboration on world wide wikis with like minds, and great minds, contributing will speed up the rate of change. We’ll think in the same metaphors though, share and reinforce new metaphors and then some Leonardo da Vinci of the 21st century will come along and break it apart. Though we may not appreciate their insights at all. Mobile learning, smart-phone learning on the move, or whatever you want to call it should shake things up. At first this will be, and is, the same old stuff sent to your phone, basic card to card Q&A even if it includes a bit if video or an animated graph. I want learning projected onto the back of my scull, I want it in my head, not online or in a device. I want interactions with specific parts of my brain. I want my brain duplicated so that I can take more lessons at the same time, to learn multiple languages and to take several degrees simultaneously. It is extraordinary the relationship between our minds and out limbs, or arms and finger tips. With training we can sight read a score and play complex musical pieces, we can scroll, cut, edit, fly and colourise images into a piece of drama that has us crying, or heads in our hands and we can type, like the clappers. We can draw too, and sculpt, and swim and dance and do gymnastics. Our relationship with the nerves in our body is a complex one. As for handwriting, our relationship with fountain pens, marker pens and pencils? It ought to be a skill still taught at school, there need to be handwriting competitions as there once were … even if they are tied into art classes and design. How different is a stylus on a tablet to a piece of chalk on a slate? I implore my children to write and draw. An illegible Christmas list is no list at all. They’d type, they do type. Yet how backwards is a QWERTY keyboard? Yes. And I mean to be part of it. A book a read if I recall in 2001 when we thought we were approaching a tipping point, actually we were reaching the point at which the first e-bubble would burst. First and last? These things go in cycles, whatever the politicians do to stymie human nature. Greed and regret, progress, reflection, reinvention … then we do it all over. We’re not even less violent than we were at the times of the Viking raids. Meandering? A stream of consciousness? Reflection? Regurgitation? All of this, and it all matters. You don’t have to read it, and you probably haven’t. This is here for me to find when I need it in seven months or seven years time. Thomson, H (2010) V. S. Ramachandran: Mind, metaphor and mirror neurons 10 January 2011 by Helen Thomson Magazine issue 2794. We’re discussing Web 1.0 and Web 2.0 only because formal academic research takes so long and nothing will change a module within 7 years of it being written. Weller talking last week is a world beyond Weller of the MAODE, yet systems aren’t in place to adapt responsively, and contact between tutors or profs and keen students is discouraged. We’ll get this new book this year yet it is out of date already. We have to move on from the book as a constriction in the stream of knowledge to a living, pre-print vibrant thing. A paper from the Instiute of Educational Technology (Agnes Kukulska-Hulme, 2011) on mobile learning is an important guide to any faculty thinking about making content available for smartphones or tablets. Firstly, only 2% of our massive student population say they are using tablets, secondly only 11% say they use their smartphone. So unless you give everyone an iPad or other device when they sign up ( an idea often thrown around) then you won’t have many using the things. Innovations are who and what we are as human kind. We will advance and trip over each other with each apparent theme or phase. It makes no difference if you are unable to carry an audience, your public, your students. Whether they pay for it, or it is free. It comes down to the ability and enthusiasm of a group of people, sometimes the charisma of an individual. I see learning environments rise and fall on the ability and availability of a single person, some systems flourish and expand – others wither. Can one person duplicate and transmogrify into a dozen or more parts? Can others pick up on their enthusiasm and replicate it? The technology is not a panacea. It makes of us a village, a community … then we must behave as if we are in a village or community, which in turn requires that we know how, when and where to contact people and who we are dealing with. Member Stories – Open University Business School voted fifth educational Business Superbrand – BusinessBecause. I’ve been sent this is a Google ALert several times which suggests the the OU UK is getting this PR shot in the right place. What interests me is if they are No.1. as a distance learning business school – this must sreuly remain the OU’s USP? Even if we see every-other university/college offering a distance learning/remote-e-learning business/leadership package of some kind. Warwick University are the latest to join the distance learning offering. This has to be a combination of a) people wanting and needing to study while in work and/or from home as well as tuition fees … though at the postgraduate level these would be substantial and self-funded anyway? And b) what the technology, and its inexpensive/ease of use qualities now can offer. We live in fascinating and fluid times. As an outside I feel like a canoist in white-water … while these institutions, their departments and personnel are being tossed around in the maelstrom of change.